Installing this means your I9000 will be rooted. Superuser installed. Note: uv 25mv for 1200 mhz works perfect. Result: Smoother and still most stable and good battery life. mana link nye pok cik?? 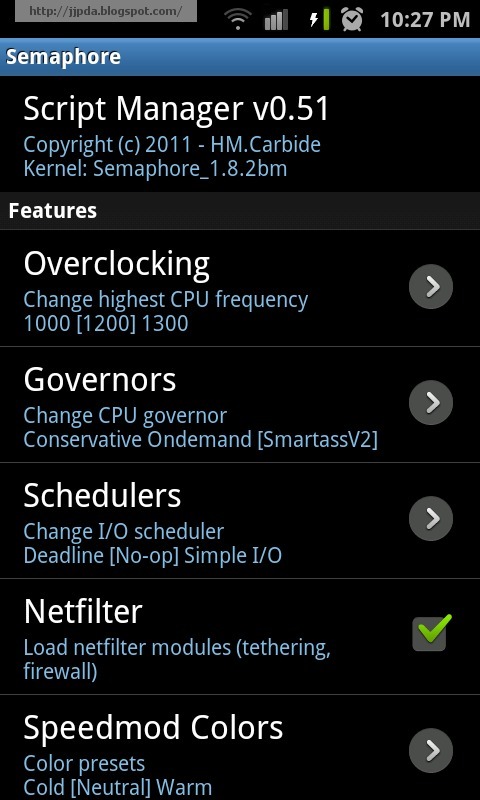 this kernel rocks! sye guna ondemand+noop je... dh try smartassv2+sio xbrape smooth home transition n else... i dunno why =S ondemand+sio pn serupa... bro guna setting yg mna? I'm with JVT stock + EXT4 + Semaphore 1.8.2bm. I've been using it since publication. Very stable and fast. I'm OC @ 1200, battery life is "unbelievable" long :). Great work with the blog pal, go on! If oc..will it hurt the battery? is stock dpi 240?if not, how to change in semaphore? Aiman: you are on gingerbread.just load semaphore via odin as above. 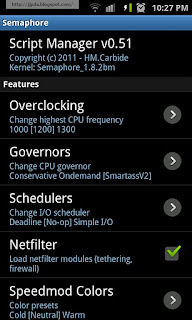 I've been using 2.3.5 JVT stock + the 1.8.2 semaphore kernel and I'm very satisfied with the results. Coming from 2.3.3 + the Vodafone customizations, I can say the that the difference is significant in terms of responsiveness and stability. Thank you for your work! There is, however, a small quirk: whenever I turn off the screen using the power button the whole screen first gets green and then it turns off. It's just for a fraction of a second, but it's noticeable. I don't know if this comes from JVT or from the semaphore kernel, though. Have you noticed this? Do you know what could cause this? I'll play with Voodoo Control, let's see. I can confirm that tweaking the gamma values eliminates the green flashing (0,0,0 -- 2.3.3 defaults). However I prefer the Voodoo defaults (-14,-17,-18). So here's the dilemma. I have to use JuiceDefender to stay for whole day. Now i uninstall Juicedefender and check how long it can last. With lagfix enable.OC not required. OC will always eating your battery. I am using the CF-Root and changed to ext4 on my i9000. When flashing this, should I change back to rfs first? And does it overwrite everything including my data?